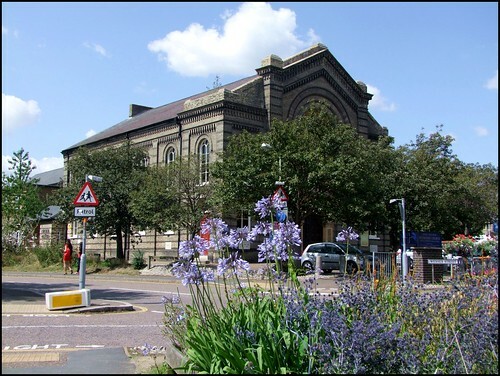 Chapelfield Methodist, or Chapel Field Road Methodist to give it its full and proper name, is Norwich's largest non-conformist church, built to have a capacity of a thousand people. The foundation stone was laid by one of those ubiquitous Colmans, and the building opened in 1881. It is set on the edge of the city centre to serve the expanding working class suburbs of south and west Norwich, and is still today surrounded by blocks of flats and terraced streets. A stretch of the city wall runs nearby, and since the chapel's construction it has gained the inner ring road rushing four lanes of traffic past its front entrance. The Rowntree chocolate factory which stood opposite has since been demolished and replaced by the massive, swanky Chapelfield shopping centre. So, this church does not hide itself away. The construction is in a classical style from greying portland stone, and it can seem rather forbidding in gloomy weather; but the frontage has enough of the new-Byzantine which was becoming popular at the time to make it rather jaunty. The interior is a pleasing mixture of white metalwork and sombre brown woodwork, the walls painted cream and green to repeat the combination of gravitas and jauntiness we found outside. The balcony runs the length of the building, curving back sharply to run along the other wall, thus creating the effect that the interior is longer and narrower than it actually is. The community here seem liberal, enthusiastic and outward looking. Their website observes that Chapel Field Road Methodist is a large, diverse and welcoming church set within the city centre of Norwich, England. As such we are always looking to be more effective in our witness for Christ within a city context. Norwich is a fine historic city of great beauty and charm - it is also a city where many people struggle and are often pushed to the fringes of justice and proper care. Finally, the pub on the opposite corner, the Champions, is, I think, one of the most characterful pubs in the city.